Hey everyone! Today’s post is savory, I’m really enjoying expanding this blog into savory territory since I do cook for myself more than going out to eat so it’s nice to show you all the type of things I cook that aren’t sweets. 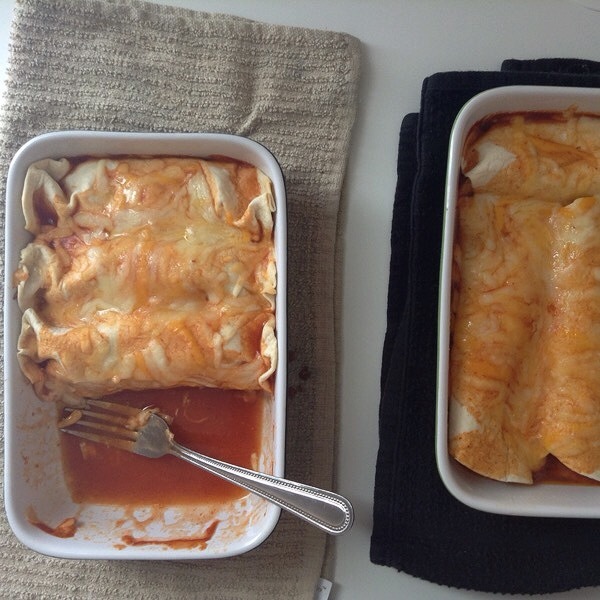 I know I called this post homemade but it’s not entirely homemade, I have never made homemade enchilada sauce but one day I would like to when I have enough free time to give it a go, but it’s homemade enough to where you’ll still look like an amazing cook and the techniques are nice as well. All in all this actually takes maybe two hours max to make and one 1 hour max to eat. Behind the Scenes (BTS): Like I said I mostly eat at home instead of going out to eat unless I know for a fact that the dish I want is something I can’t make like Mexican food. I really love Mexican food and the older I get the more I love it; where I grew up there were plenty of Mexican restaurants to choose from but oddly enough when I moved to a major metropolitan city for university I couldn’t find a really good Mexican restaurant that didn’t have Chipotle written in big letters, after a while when I couldn’t take it anymore I decided to give making my own Mexican food a go and it went great, like I already said I would love to try and make real homemade enchilada sauce one day and hopefully I can share that experience with you as well. When it came to making this dish I went to my good old helpful social media site of Pinterest, I looked at different recipes, techniques and fillings before deciding which ones I would take from each to make them my own, I love chicken and love cheese, even though I’m lactose intolerant but there are days when I say screw it and eat it anyway and the day I made this enchilada was one of those days. 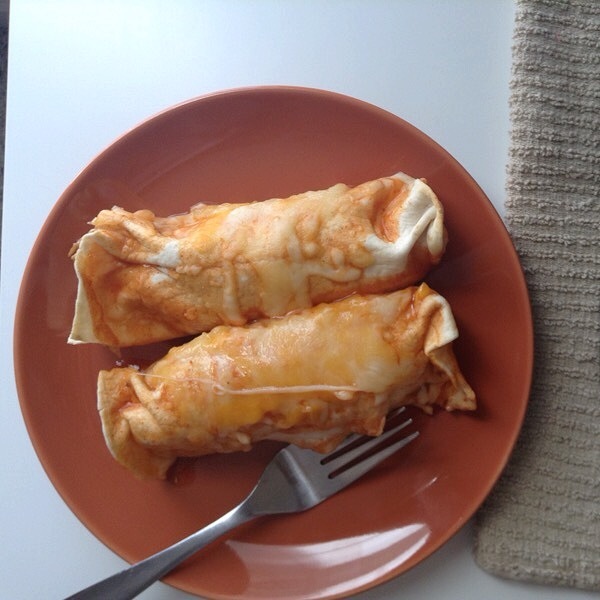 The sauce I choose was a regular non-name brand enchilada sauce, I prefer the non-name brand sauces as they usually only have the basic ingredients which allows me more leeway to make it my own according to my specific flavor preferences. So that’s something to think about when you choose your sauce, if you like it spicy like I do buy mild and make it spicy yourself, if you like your food mild then buy mild and add some extra flavorings that give it a kick of flavor without the burn of spice. This time I bought mild because my roommates don’t like spice as much as I do. Adjustments: Barely any of the recipes I found called for additional vegetables, once again I love spicy food and prefer my vegetables spicy, I also have been trying to add more vegetables to my diet lately and decided to put some into this dish. The vegetable component is completely optional but I love the texture it gave in compliment to the chicken and the flavor it adds to the dish. In this post however I left it Plain Jane just in case no one was into the vegetables. I also poached the chicken in additional enchilada sauce, I don’t like plain chicken just cooked with salt and pepper and prefer to give my meat any additional flavor it can get. 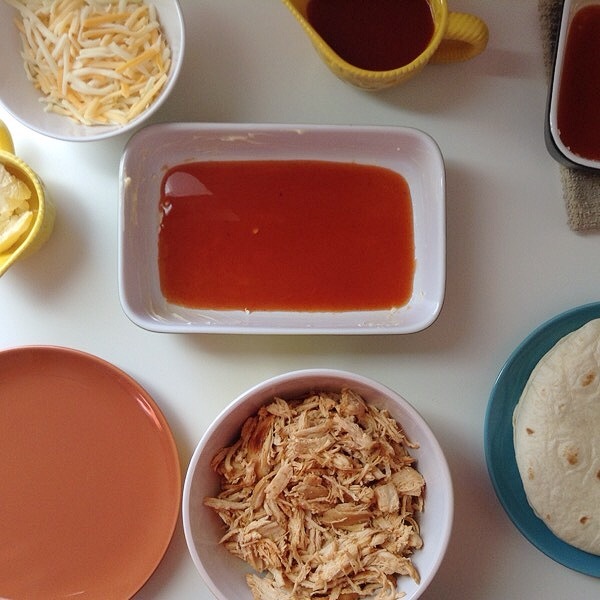 It also helped the chicken not get too dry since chicken breast lacks a lot of fat which can dry it out in a roasting or baking process so poaching it in a liquid stops that from happening and infuses the flavor of the enchilada sauce into the chicken. Alterations: If you don’t want any meat this is a perfect vegetarian option, simply add cheese and your vegetables and follow the same cooking directions. You could also add some rice and beans to give it some heartiness. Rinse 1 cup of rice (190 grams) and boil 1 1/2 cup of water (340 grams), once all the starch has been rinsed out from your rice (you will be able to tell because the water won’t be that opaque milky color but clear) put your rice and 1 small can of black beans (rinsed as well) into your boiling water and add 1 tablespoon (15 grams) of butter and 1 teaspoon (5 grams) of salt, turn heat down to low and cook for about 25 minutes, check after 20. If you want beef then take 1 pound of ground beef (450 grams) (you could also use shredded beef) and cook in a skillet over medium high heat until fully cooked, add 2 teaspoons (10 grams) of salt, 2 teaspoons (10 grams) pepper and 2 teaspoons (10 grams) of red pepper flakes. 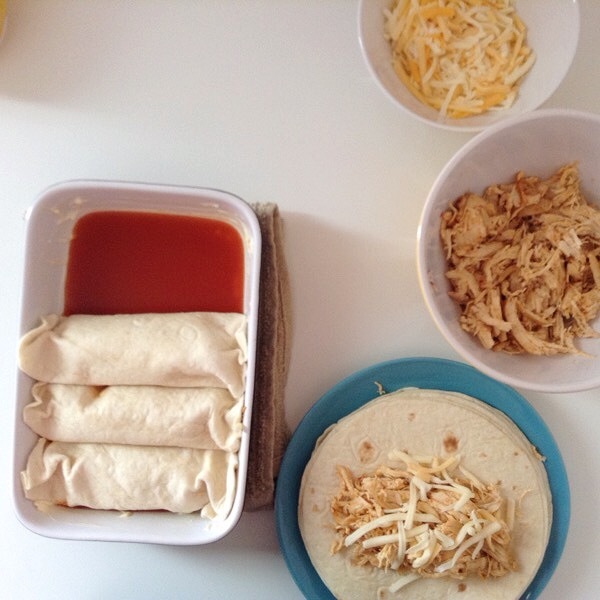 Once fully cooked add about 1 cup of enchilada sauce (225 grams) to your ground beef and cook for an additional 10 minutes, add it to your tortilla like you would the shredded chicken. Helpful Hints & Suggestions: First and foremost I would suggest you make sure your meat it fully cooked, if it’s not that is a major health concern. Other than that there aren’t really many suggestions I would give you, this dish can’t really go wrong simply because you make it to your preferences, I liked a lot of chicken in mine so I added more chicken than I did onions and peppers, so I would say stick to your portion guns and stick to your flavor preferences. I would also suggest adding different vegetables if you would like, corn is a great option, green beans etc. You can find a lot of awesome additions to this recipe in the ethnic isle of your grocery store. Ta-Ta-For-Now: Well this is the end of this savory post, if you have any questions on how to make this or helpful suggestions I didn’t answer in the post then ask in the comment section and I will answer to the best of my ability. I hope you all enjoy this post and make this dish soon, it’s seriously awesome. Also if you want to know how long this dish will last the answer is only a few days after three or four days I would say it’s been too long. 1. Organize, Clean and Poach: The first step in any of this is first to organize your ingredients. 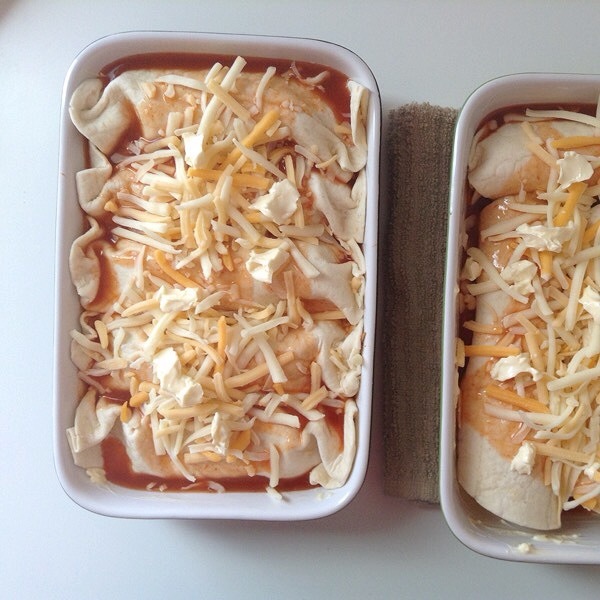 (Make sure you have about 1 1/2 (150 grams) cups of cheese saved to the side to sprinkle over the enchiladas before your put them in the oven.) Then follow with cleaning your chicken. In a small to medium size bowl pour about 1 cup (225 grams) of white distilled vinegar (or lemon juice) and 1 cup (225 grams) of water followed by the chicken and proceed to clean it. Simply rinse it around and then rinse it in water. 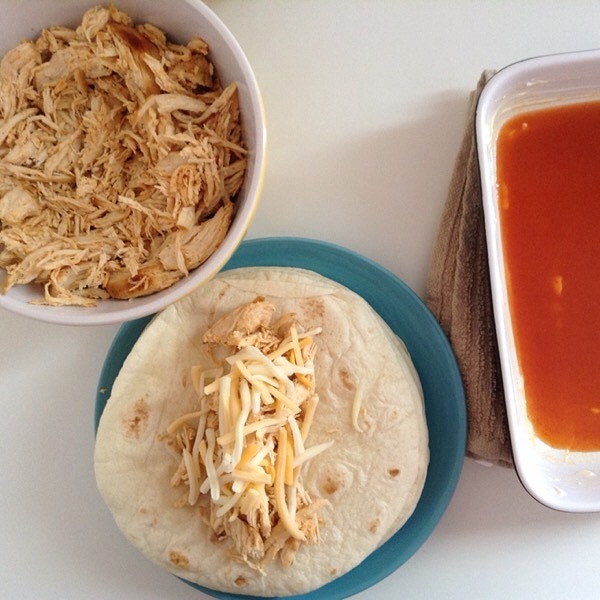 After you’ve cleaned your chicken add the salt, pepper and red flakes (this may seem like a lot of salt and pepper but it’s worth it) in your sauce pan and pour one can of your enchilada sauce into the sauce pan along with the chicken. On about medium-high heat, poach your chicken for 45 minutes to an hour. (To make sure your chicken is fully cooked put a meat (or digital) thermometer to the thickest part of the chicken, if it reads 165F/74C or higher it is fully cooked. Once the meat is fully cooked, allow it to cool down and proceed to shred it with two forks simply pulling it apart. a. To Roast: In a 400F/205C oven put your onion and pepper into a cookie sheet and let it roast for about 15 to 25 minutes. b. Grilled: On your grill (indoors or out) oil your surface once hot and grill your onions and peppers for about 3 minutes on each side, check after 1 minute depending on thickness. 3. Assembly is Required: Once your chicken has been poached and shredded and your vegetables are chopped and maybe cooked begin to assemble; you also want to grease your baking dish with butter to stop any sticking. 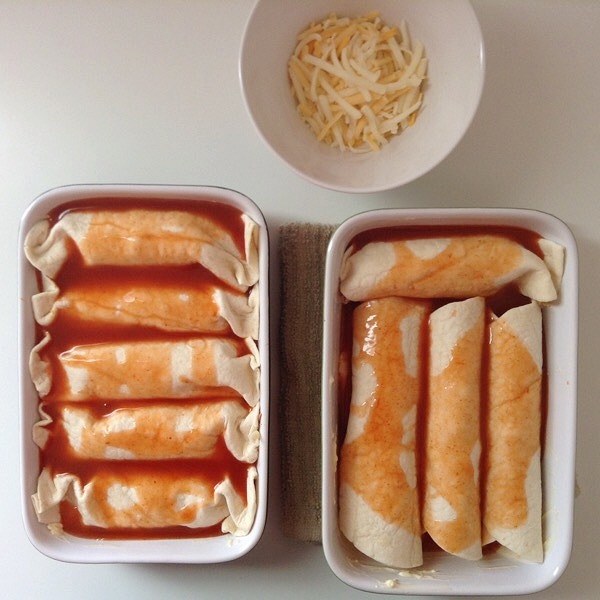 a. Pour some of your second can of enchilada sauce on the bottom of your baking dish, enough to cover the bottom. b. 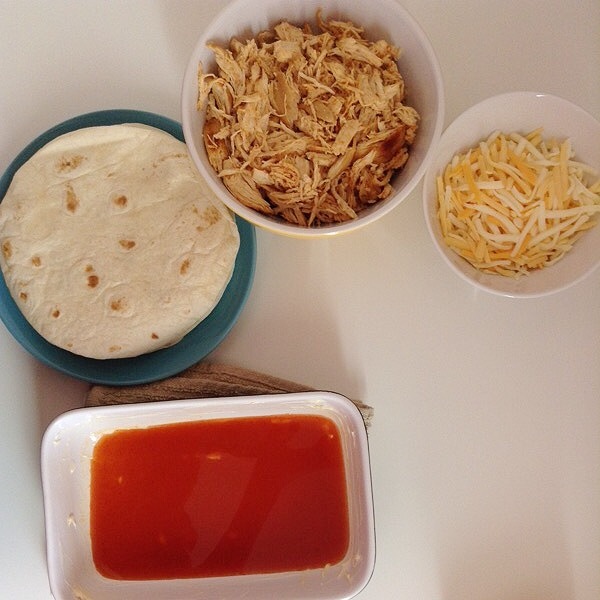 Take a tortilla and fill with chicken, the amount is your decision but make sure you have enough to fill 8 to 10 tortillas; follow this by your onion, pepper and cheese, once again the amount is your decision. c. Once your tortilla is filled begin to roll it up like a cinnamon roll. 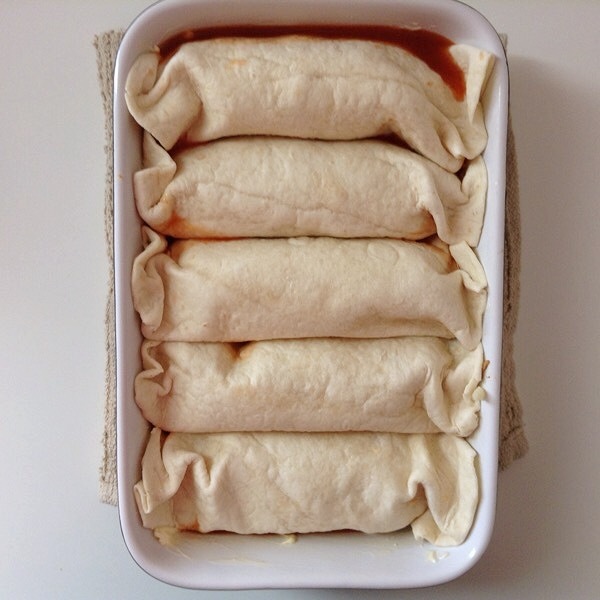 Put your enchilada in your baking dish and continue with the rest. Once again this should make about 8 to 10 individual enchiladas. d. Once all your enchiladas have been made pour the remaining enchilada sauce over the enchilada tortillas and sprinkle some left over cheese (and onion and peppers if your prefer) over the sauce. 4. Bake & Enjoy: Put your dish in the oven on 350F/180C for 15 to 20 minutes, check after 15. 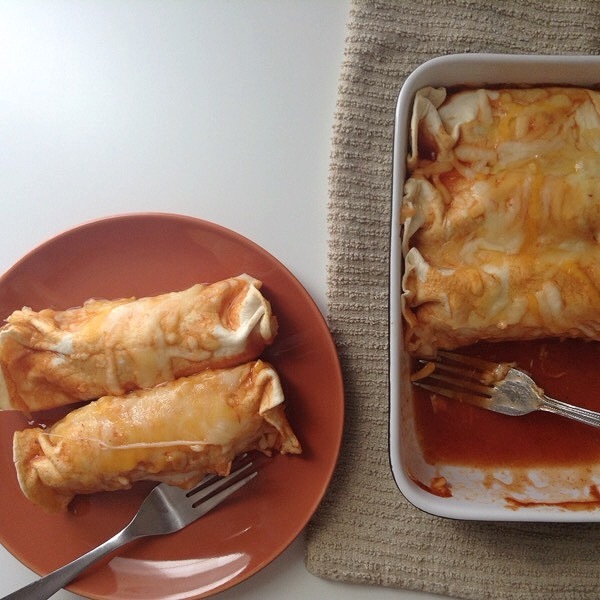 Let it cool down for about 15 minutes and proceed to eat the deliciousness that is this shredded chicken enchiladas. I’m a savory kind of girl, I really couldn’t care less about sweets- but I have a hard time passing up salty/savory delights. These look fantastic! Mexican is my fav. Thanks for sharing!